Datasheet – Get the latest product datasheet. Manual – Get the latest User Manual. Click Product Support (below) to see all the manuals available for this product. Firmware – Get the latest firmware version for this product. Click Product Support (below) to see all the software available for this product. FAQs – See Frequently Asked Questions that relate to this product. Product Support – Get manuals, application notes, software, videos, and other support information related to this product. Warranty and Service Information – Get warranty, calibration, and service information this product. With four isolated channels and up to seven hours of battery life, the lightweight THS3000 Handheld Oscilloscope Series enables you to safely make floating or differential measurements on your bench or in the field. Now you can tackle tough environments with the performance you expect from Tektronix – safely and affordably. With a battery life of 7 hours and a weight of only 4.8 lb. 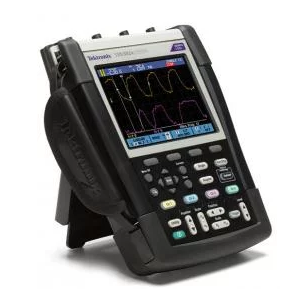 (2.2 kg) the THS3000 Handheld Oscilloscope Series offers ultimate portability. Measurements taken in the lab can now be conveniently correlated with those taken in the field – all on the same instrument. Rated IP41, the THS3000 Series features the ruggedness needed to go beyond the lab and into industrial and field environments. The optional travel kit comes with a hard-sided carrying case and useful accessories allowing you to take the THS3000 Series on the road securely and conveniently. From the lab to the field, the THS3000 Handheld Oscilloscope Series offers you the versatility of using a single, high-performance instrument suitable for a wide range of working environments.